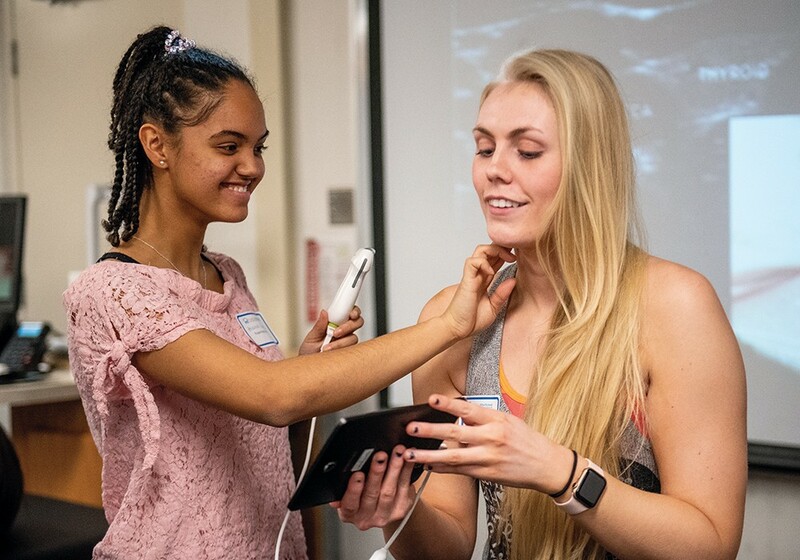 Brianna Vann, left, a junior at Rogers High School, learns to perform an ultrasound scan on Lauren Wells, a University of Washington medical student as part of the Med for Ed program. When Mara Hazeltine followed her undergraduate degree with a two-year stint with Teach for America, the connection between health and socioeconomic factors like poverty and education became increasingly clear to her. In her middle-school classroom, she saw how certain students suffered from ill health as a result of their life circumstances, and how that could impair their ability to succeed. That experience reaffirmed Hazeltine's desire to attend medical school. But it also did more than that. It inspired her and classmate Brittany Cooper to co-found the Med for Ed program during her first year at the University of Washington School of Medicine in Spokane in 2015. "I fully believe that health is informed by social determinants, and to be a good doctor, you have to understand what your patients are going through in their personal lives," says Hazeltine. "If we can connect medical students to that idea, we create doctors who are more thoughtful about the big picture." As part of the Med for Ed program, UWSOM student volunteers assist in classrooms at Cooper Elementary and Rogers High School on a weekly basis. Grace Andrews, who currently co-leads the Rogers initiative along with fellow student Bret DeGraff, says that they function not only as tutors and teaching assistants, but also as mentors and role models too. "The unique thing about this is allowing kids in high school to see an opportunity in medicine, to see people who are still pretty close to their own age actively pursuing a career in the hard sciences and in the medical field," she says. And the benefits go both ways. "As physicians in training, we all understand that something that's really important about being a physician is being invested in your community beyond medicine. We all want to find a way that we can get to know our area and give back. But we also see it as a way to get to improve our practice, to get to know the people we'll eventually be taking care of." "...something that's really important about being a physician is being invested in your community beyond medicine." Med for Ed is just one of several service-learning opportunities for the school's medical students. There's also ongoing involvement with the Walking School Bus, as well as a health-education partnership with Union Gospel Mission that generally takes the form of clinical care. "With the students came a whole lot of energy from the medical community. A whole bunch of doctors kind of joined up at the same time as the students. There's this electrical thing that happens with all of them together," says Annie Crain, a former RN who now volunteers as a youth outreach coordinator at UGM. As in Med for Ed, the presence of UWSOM student volunteers also helps to unite people from different walks of life. "The homeless community that comes to Union Gospel Mission see people in the medical community that look them in the eye, that really care about them, that treat them as human beings, that see the image of God in them and will not treat them like second-class citizens. People feel welcomed, and it's really an all-over beautiful thing that happens every Saturday morning," says Crain. William Sayres, M.D., an assistant dean with the UWSOM, notes that these service-learning initiatives are rare in medical education because they're not a curriculum requirement. Instead they're "utterly self-organized" by the students. "None of these projects are cooked up by faculty," he says. "We don't make them to do this. But in the goals of what we expect to produce with our students, one of them is fostering what we call a dedication to service, in particular caring for the underserved. This is giving students the opportunity to serve, and it's far more meaningful to them if they organize and deploy it themselves. It's super impressive." The original print version of this article was headlined "At Your Service"